What do we have here? It’s a complete dungeon builder tile set! All assets are hand-drawn, they have an organic feel and there are many variations to each tile so no part looks the same. This tile-set produces gruesome, dark looking dungeons. Perfect to evoke a vibe of mystery and underlying danger. All assets are labeled with the dimensions in squares to look properly in the Roll20 tabletop (i.e 4×4) Note that some dimensions apparently don’t match, like a 2×2 room labeled as 4×4. This is because of the walls that take some space and the transparent layer behind them. If you follow the labeled dimensions everything will look awesome in the end. 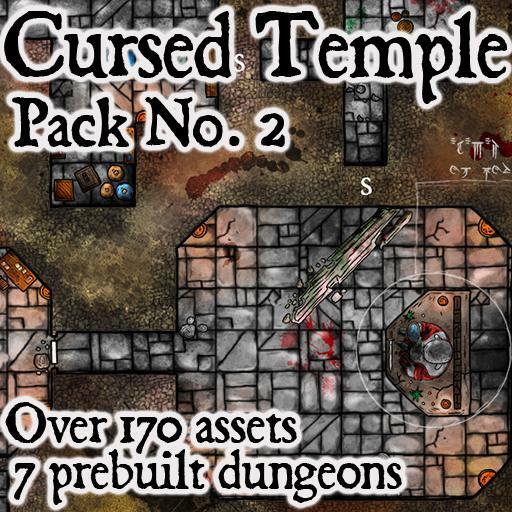 This pack contains over 170 different assets to build an awesome dungeon. It also includes some tokens for furniture and general decorations inside the dungeon. This pack also include 7 prebuilt 26×26 dungeons ready to be dropped in a game. They come in a variety of empty and/or furnished. They are also great examples of what can be achieved with this pack’s assets alone.